The Rules: The golden rules of great poses. Using visual queues, praise, energy and authenticity and much more. The Way: The most chunky part of the book. Gina will show you how to connect with people, organise and direct like a pro. She then dives into specific details of different posing scenarios (men, women, children, couples, groups and more) with loads of examples for you to refer bad to again and again. These handy 'printables' are designed to fold up beautifully to pop in your camera bag and pull out whenever you need them. In total you'll have 67 sample poses to give you some great starting points when you next do a portrait shoot. About the author: Gina Milicia has been a professional photographer for more than 25 years. She has photographed some of the world's most powerful and famous people including royalty and heads of state, billionaires and a-list celebrities and been on location in some of the world's most exotic places. Portraits: Striking the Pose bundled with the printables is effectively 33% off for the launch sale ($30 value for $20). It also carries a 60 day no-questions-asked guarantee, if you are not satisfied with any part of the book just let them know and they will give you a full refund so there is no risk in trying it. Creative portrait photographer Benjamin Von Wong knows how lucky he is to be doing what he loves every day. With a vision, a creative mind and soul, and a lot of determination, he turned his photography hobby into a life, and a pretty cool life at that. The award-winning photographer, admired for his "epic, surreal, fantasy storytelling,” talks about how he takes a concept and transforms it into reality. He says it’s not just about taking pictures, it’s conceptualizing, designing, and creating. Von Wong comes up with a base concept, an idea, and he builds it up based on the constraints that are available. Since he specializes in fantasy storytelling, he has to come up with creative ideas to portray the illusion, to make it real. Basically, he has to find solutions to take something that is seemingly impossible and turn it into reality. I like to think of my photography as something epic, something larger than life. It takes a vision and it exaggerates it so that you can’t tell the difference between what’s real and what’s fake. It’s really amazing how passionate Von Wong is about his work–you can’t help but be inspired by this guy! Flags are waving, confetti streaming, crowds of people line the streets. Who is all this fanfare for? How about a little dog that looks a bit like Toto from The Wizard of Oz? 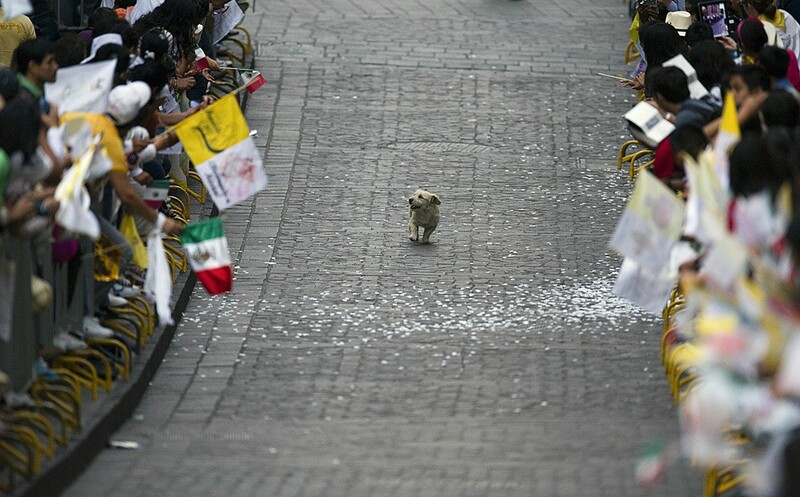 As much as we all love our dogs, the parade wasn’t thrown just for the pooch—but don’t tell him that; he’s enjoying the attention too much. Photographer Yuri Cortez captured the little guy taking a stroll down a street in Guanajuato, Mexico right after Pope Benedict XVI passed through in the Popemobile. Isn’t it fun looking through old family photo albums? They make us nostalgic for the “good old days.” Sometimes they make us wish we could go back, but would we really want to? We're incredibly pleased to announce that Practical Photography and Digital Photo will be at The Photography Show on 1-4 March! It promises to be an amazing few days, with all the key manufacturers and retailers showing off the latest kit, loads of great photographers giving talks and workshops, and catwalks and studios to point your lenses at. To celebrate, we've got an exclusive discount - click here and enter the code BCM142014 when you check out and you'll get £3 off adult tickets. The discount is active until 28th February. See you there! Join us at The Photography Show! Practical Photography and Digital Photo will be at The Photography Show on 1-4 March at The NEC, Birmingham, and we’ve got loads of free tickets up for grabs, which we’ll be giving away every week until the show. To be in with a chance, click on the link below and answer the simple question. Be sure to pop by and say hello – we’ll be on hand with free magazines, prize draws and a whole lot more! Free Lowepro Passport Sling worth over £45 when you subscribe! Don't miss another issue of Practical Photography and Digital Photo! You can now choose print only, print and iPad, or iPad only, so select the option for you and we'll send you a Lowepro Passport Sling bag, worth £45. You can now join the PP team for daily updates, exclusive behind the scenes sneak peaks, and the best photo-related news stories and insights. Take part in our 'Freebie Friday' giveaways, where you can win goodie bags, and have your say on what really matters in the world of photography. Click here to join over 8000 like-minded enthusiasts who are already getting stuck in. You are receiving this message because you signed up to receive www.photoanswers.co.uk newsletters.